Google Squared Comes Later This Month ! Google Squared is another filter-import-and-export-joins-gmail-labs-enjoy-the-new-experience/">new feature will be hitting Labs later this month (apparently at www.google.com/squared). 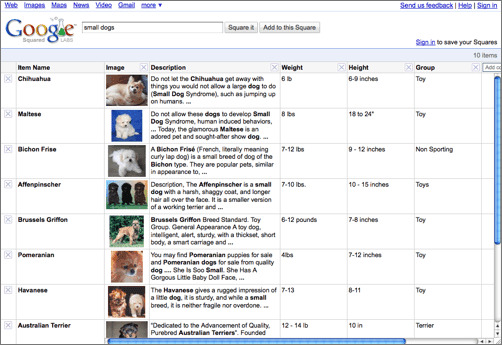 This feature is easy and different, if you type “Small Dog” then Google will try to return types of small dogs withgoogle-brings-color-selector-to-search-by-color/"> facts like how much they weigh. Moreover, it is easy to add a row to the Square; therefore, you can add a row for Lhasa Apso and Google will bring the supposed facts from google-page-creator-will-be-closed-in-june-2009/">the web. how-to-enable-sender-time-zone-in-gmail/">Want to enable Sender Time Zone in Gmail ? In addition, it is possible to new columns; if you will type “enhanced-google-search-results/">energy level” then Google will look for the confirmed facts across the web to bring the energy level of how-to-send-sms-via-gmail/">each type of dog.